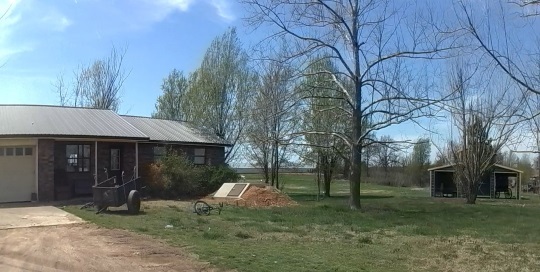 There are just four Amish communities in Oklahoma, though two of them have formed since 2010. Oklahoma has had limited Amish settlement over the years. I believe that has something to do with the climate and farming conditions, which have hindered Amish attempts to settle the state in the past. We virtually visited the Chouteau Amish community earlier this year thanks to the dash cam of Tom Geist. This is the Sooner State’s largest and oldest Amish population, with four church districts and a founding date of 1910. Chouteau is also the largest Amish community once you get west of Missouri. The Clarita Amish settlement is the state’s second oldest, founded in 1978. It’s known for its school benefit auction, held annually for over 25 years. Amish here use tractors in the fields (as they do in Chouteau), reflecting the difficulty of farming with horses in this part of the country. Welch is a small town of around 608 people. There were 8 Amish families until just a month ago when one moved to Princeton, Missouri. 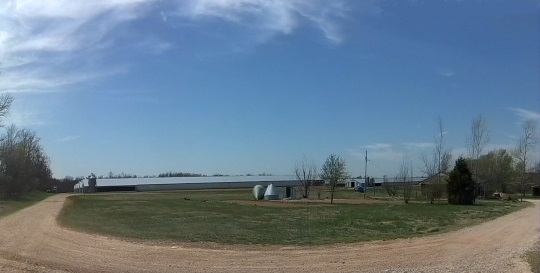 One of the few Amish farms in Welch. Which buggy would you prefer to ride in? Second Amish farm. A nice couple with 5 children live here. Kenneth writes for The Budget Amish newspaper. Had a great time chatting with him and his wife until just after midnight. Hope to get back down to visit another time soon. 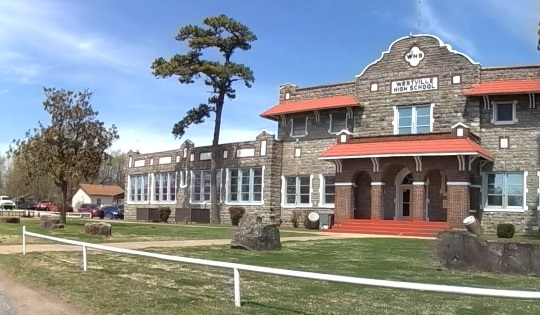 Westville, OK is a town of around 1,599 people located close to the western edge of Arkansas. They are 29 miles to the west of Fayetteville, Arkansas. This Amish community, according to Sara Ann Yoder (Mose & Sara Ann Yoder), the Amish woman that writes for The Budget newspaper, is comprised of families that do not own their own land, but rather are hired in by companies such as Tyson to work on chicken growing projects for a period of time. There were 13 families there when I visited, with 5 of them trying to stick to the Old Order Amish ways a little more than the other group. Church is still held in the houses they have, even if they don’t have large homes. Not an Amish picture at all, just a neat looking high school building that stands out when you drive by it. Here you can see the chicken farm in the distance. I was going to go look closer, but I was… I was… (wait for it)… I was chicken! I almost missed this place but at the last moment I saw the silhouette of the buggy back in a shed. Families that are hired on by the chicken companies are given English housing to use while they are there. So it is even harder to find the Amish in this area, unless you find one out in their buggy and follow them. 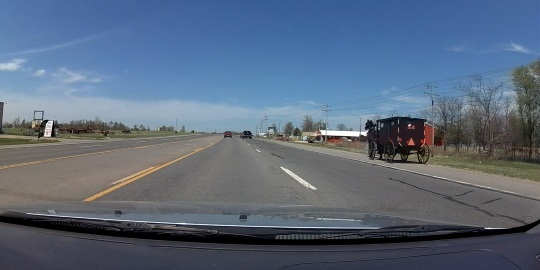 Finally, an Amish buggy on the road, something I had not see in Chouteau at all the day before. I visited Chouteau last summer in order to research for my upcoming Plain & Simple Miracles series. They are very friendly folks. We were surprised to see all of the tractors the Amish youngie were driving to town. Folks told us that the buggies are for Sunday, weddings, and funerals. Thanks Tom and Erik for the mini-tour. Kind of a “fowl” joke…. A rather cheep attempt at humor. Nice to see Amish “expansion” in the OK area. I guess if Chouteau has survived since 1910, there’s a reasonable chance the newer settlements might, also. I was a bit surprised to hear about the “commercial” (though Amish-run) chicken farms, and that those Amish don’t own their own homes. Now I’ll always wonder if I’m eating Amish-raised chicken! Thank you again, Tom & Erik. There have been at least one or two Texas Amish communities which had this temporary type of character, with Amish working for local agricultural concerns and not owning their homes. The extinct settlement at Stephenville, Texas in the late 1980s was one. Amish there lived in mobile homes or small houses equipped with electricity. I didn’t know there were other settlements like this until I heard about this one from Tom. 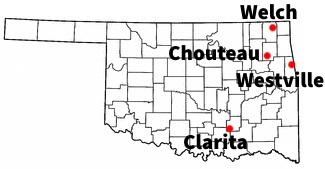 I live in Oklahoma, not too far from Clarita. I’ve been to the Amish auction for the last three years, it’s a lot of fun. I hadn’t heard of Westville before. Very interesting. I have two Singer treadle sewing machines left to me by my mother. I can offer Transportation on the weekends to anyone that needs it for a reasonable fee. Please contact me at (405) 620-1930 for more information.